A week in the life of the TSA is already ridiculously productive. What about seven months? The TSA published a 2012 year to date report to reveal what the apocalypse year has brought through airport security and it's a doozy of bizarre weapons. 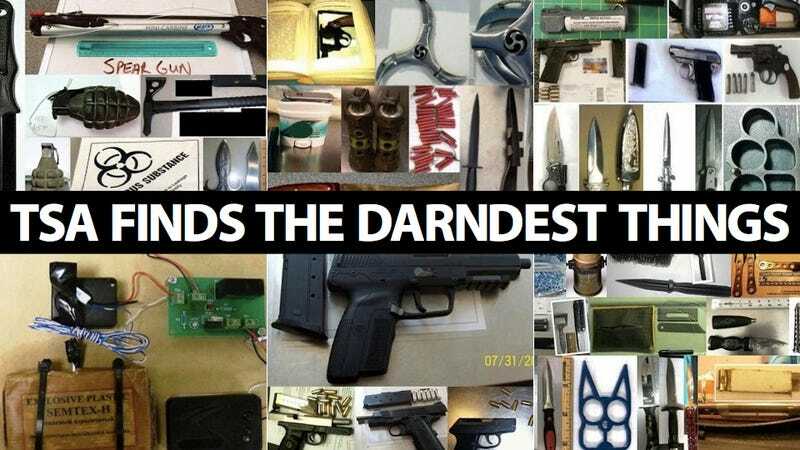 Things like guns and bombs aren't enough anymore, the TSA finds grenade launchers, venomous snakes, gassed up chainsaws and more. It's really shocking what the travelling idiots of the world carry around with them in their carry-on luggage. From January to July 2012, the TSA found 821 guns (691 loaded with 210 locked and loaded) in carry-on luggage at 160 different airports. That's four firearms on a typical day! People were getting creative too, do you remember the disassembled guns hidden in stuffed animals?